The Capital Triumph Register is proud to announce that the 22nd annual Britain on the Green (BOG) will be held at historic Gunston Hall, the colonial home of patriot George Mason, in Lorton, VA, on April 28, 2019. BOG, which welcomes all British cars and motorcycles. is well-established as one of the premier all-British shows in the metropolitan DC area. Mark your calendars now and plan to attend as we expect this year to be the best ever! In addition to hundreds of beautiful British vehicles on display, we’ll have live music, a Food Truck Alley, a sponsor/vendor Midway for your automotive needs, activities for children, and tours of the Gunston Hall mansion and gardens for participants and spectators. 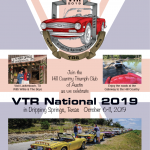 Participant’s Choice honors will be awarded in 25 or more classes of British cars and motorcycles. There will also be a number of special awards including Best Resto-Mod, Best Survivor. Best Display, and of course, Best of Show. In addition, we will have Hagerty Youth Judging in which the next generation of British car drivers picks their favorites. So please plan on joining us on April 28th for the 22nd annual Britain on the Green. 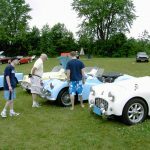 It is a great day to bring out your car, celebrate the arrival of spring, and kick off the British car show and driving season with friends, family, and fellow enthusiasts. Cars pre-registered by April 15 will receive the collectable 22nd anniversary show poster by famed artist Joseph Craig English. All for $25, a savings of $10 from day-of registration.